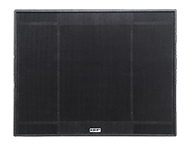 The CXL3134 is a 3-way box using the latest state of the art drivers capable of delivering high fidelity sound at extreme SPL’s with high intelligibility over a wide coverage pattern due to the symmetric, coaxial horn loaded midrange and high frequency system. HF driver: 1 x 4 inch, Titanium Diaphragm, Neo Magnet, latest distortion reducing design. Sensitivity 109 dB/1W/1m (>110 dB from 1 to 4 kHz). Power handling	280W continuous program. MF drivers: 4 x 6.5 inch, neo magnet, horn loaded. Sensitivity 104 dB/1W/1m. Power handling 1200W continuous program. LF drivers: 4 x 14 inch, neo magnet, reflex loaded. Sensitivity 104 dB/1W/1m. Power handling 4000W continuous program. Crossover frequencies: 270 Hz, 1 kHz. Frequency Response: 48 Hz to 18kHz. Maximum Program Output: 140 dB/1m (filtered noise 80 Hz to 8kHz). 108 dB @ 40m. Nominal Coverage: 90 x 60 degrees, symmetric due to coaxial driver arrangement. Dimensions: 45 x 36 x 22 inches (114.3 x 91.5 x 56 cm). Construction: Baltic Birch Plywood with black rubberized polyurethane finish. Custom colors available.